The time has come for Jewelry Club tutorials again! This time, we made necklaces out of hardware – washers, to be specific. I really liked this idea, because it’s easy, cheap, and looks really neat, but it’s also something that you can make without thinking too much about it, so if you want to focus on other things, like conversation or word games, you won’t mess up. 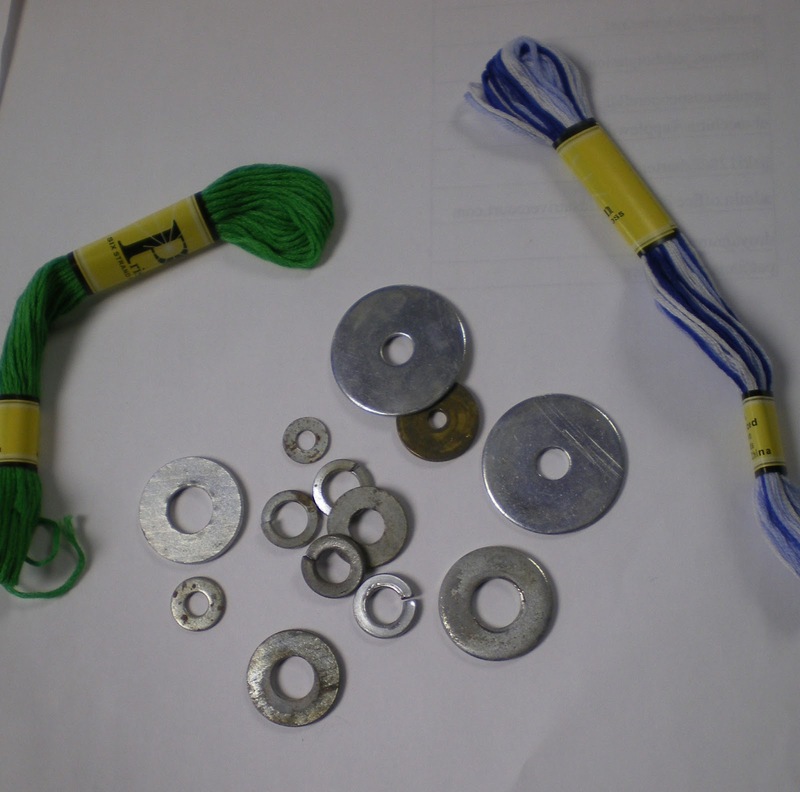 To make these, you need washers – our building manager gave me a box of washers in assorted sizes, so that didn’t cost us anything, but it’s not expensive to get them at a hardware store, and then you can pick whichever size you like. You’ll also need embroidery floss. I bought a 100-skein back of floss on sale, so we could all pick whichever colors we wanted. I find that the bigger the hole is in the washer, the easier it is to do this project, but it’s not impossible to do this with smaller-holed washers, either. To start choose your embroidery floss – I liked the ones where the colors were variegated within the skein, so it wasn’t all one shade of green, but that’s a personal preference. 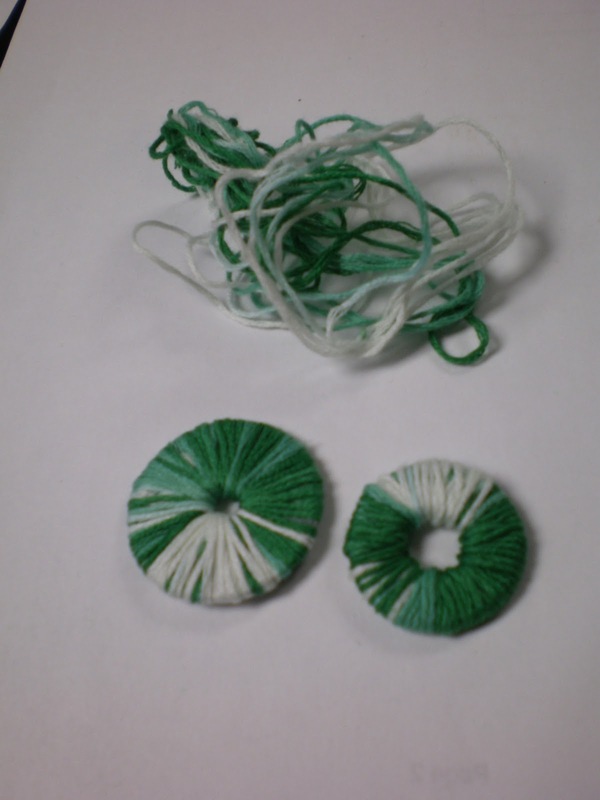 You’ll only need about half a skein of floss (at most) for this project, so you can cut that much off if you like (or use the whole thing and cut later – it takes longer and is more apt to get tangled, but then you know you have enough floss). Tie one end of the floss to the washer, and start wrapping it around. And around and around and around. The variegated colors end up looking something like this, with the color gradually changing from light to darker and back, but it’s tricky to keep the colors from overlapping and intermixing. Which looks pretty cool, too. When you get to the end, tie it off with a knot before you cut off any excess floss- it’s a lot easier to tie it if you have extra string left over. You could also glue it, but that adds an element of messiness to the project that otherwise isn’t there. I’m sorry I don’t have a photo of this step. One skein of embroidery floss goes a long way; I made two necklaces out of this one, and still had quite the tangle leftover afterwards. 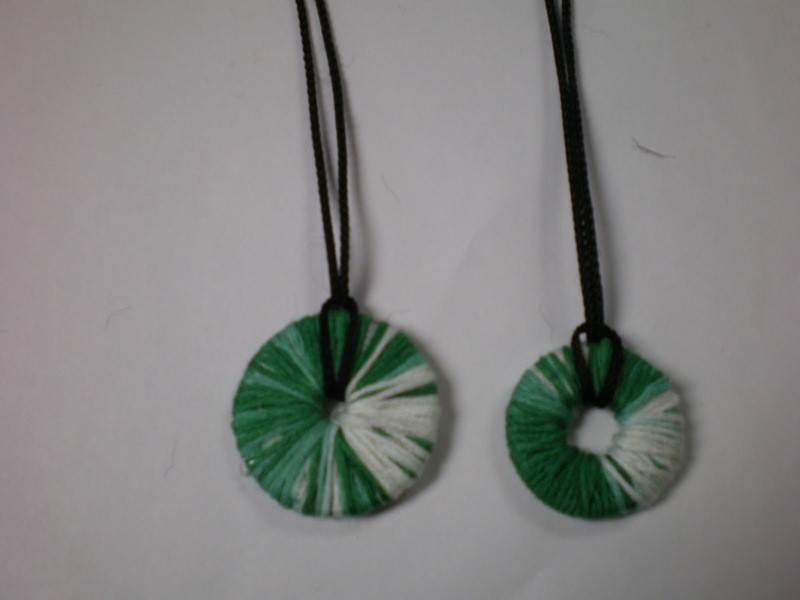 Once you have your pendants ready, the next step is to string them. You can simply put the string through the (very handy) hole in the washer, or you can do what I did here. 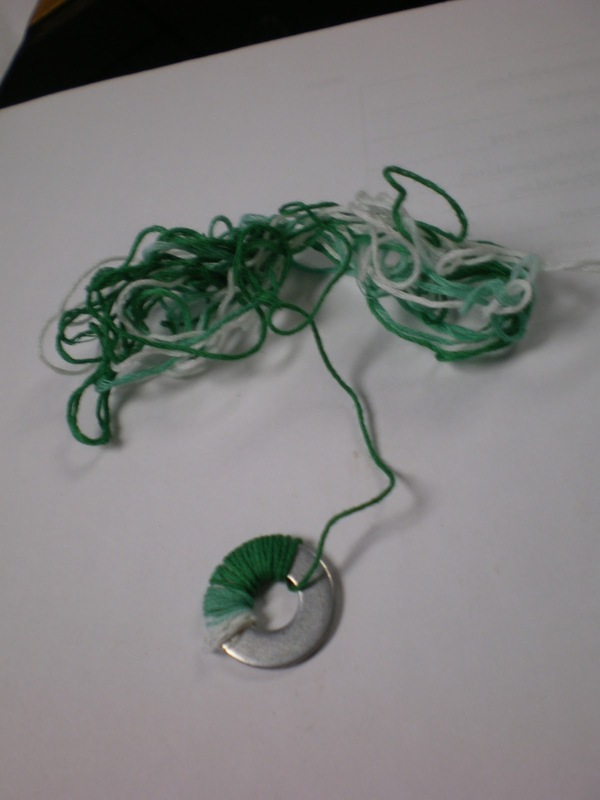 I tied off a necklace-length loop of string and threaded the loop through the string. Then I pushed the tied end through the loop, and pulled it closed – the same way you make rubber band chains. 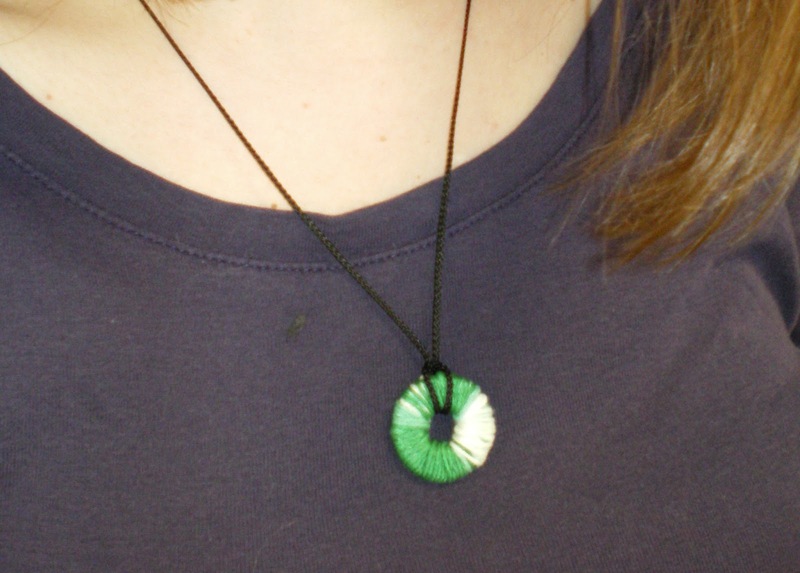 These are a pull-over-your-head necklace, since I didn’t want to sully a floss necklace with a clasp.